← The FBI’s Most Unwanted 2: Belly Up! Picture this: A gorgeous young woman is put under a spell which compels her to follow every command she’s given without question or pause, and even to forget what’s she’s seen, heard and done while under this spell. Sounds like the set-up for a sleazy stroke story, right? Wrong! 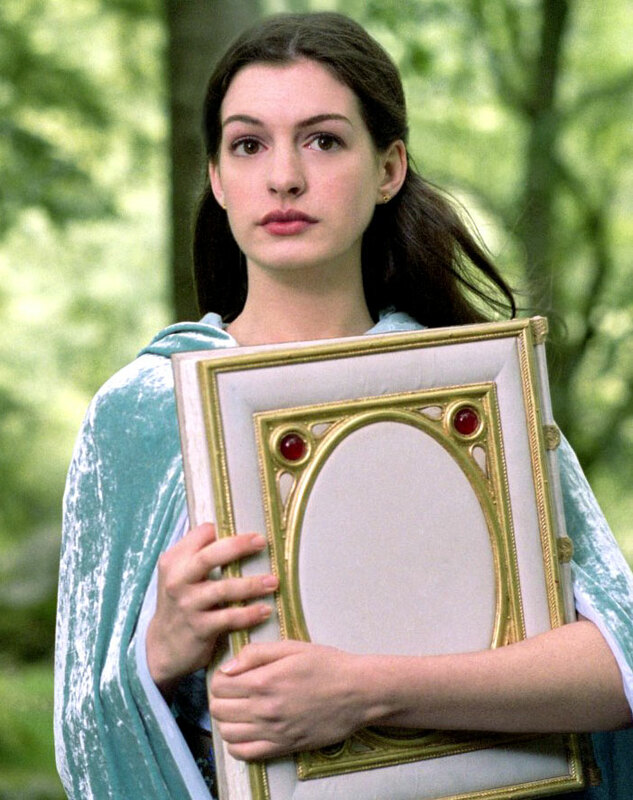 It’s actually the premise for a family-friendly fairy tale comedy, called Ella Enchanted (2004). Obviously our main “person of interest” here is Anne Hathaway, who plays the eponymous ‘Ella’ with her usual charm and gusto, cheerfully throwing herself into crazy slapstick, slushy meet-cutes, wire-work fight scenes, and full-blown song-and-dance numbers, with equal aplomb. It’s impossible to overstate just how damn adorable this woman is… both on-screen, and in the accompanying commentary track. 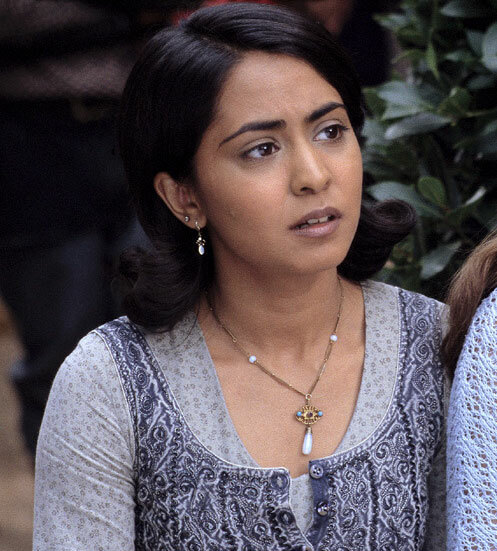 Nevertheless, my major motivation for picking up this DVD was the fact that Parminder Nagra appears as ‘Areida’, Ella’s long-term BFF. Sadly, she scores less than five minutes’ worth of actual screentime, and barely says a word, despite her character’s pivotal importance to the plot! 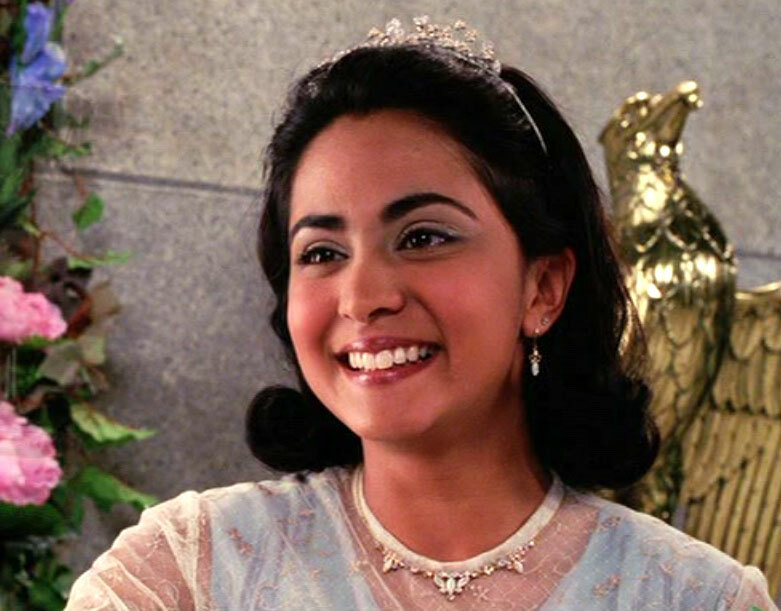 We first see Areida in a childhood flashback, being bullied by a couple of mean girls in the playground, who make fun of her name and general foreignness. Ella steps in to defend the new girl, and literally sinks her teeth into the lead bully’s arm when she foolishly exclaims “Bite me!” This scene is used to illustrate that even though Ella is obedient to a fault when given a direct instruction, she still has her own mind, and her own beliefs. In the present day, Areida accompanies Ella on a demonstration to protest the royal family’s treatment of Ogres, Giants and Elves, who have all been banished to the forest, and forced to slave away for their human masters. She also criticises Ella for mindlessly doing whatever her bitchy step-sisters tell her to do, apparently unaware that her best friend is actually the victim of a magickal curse… because Ella’s dying mother instructed her never to tell anyone about the curse, foolishly believing that this would protect her daughter from being exploited, even though the exact opposite is true. The baddies simply need to observe Ella’s behaviour for a little while to deduce her unfortunate condition, so having some friends who knew the truth might actually have saved her a lot of hassle (assuming they stayed in close enough proximity to counteract the really dangerous and degrading orders she was given by unwitting or malevolent others). 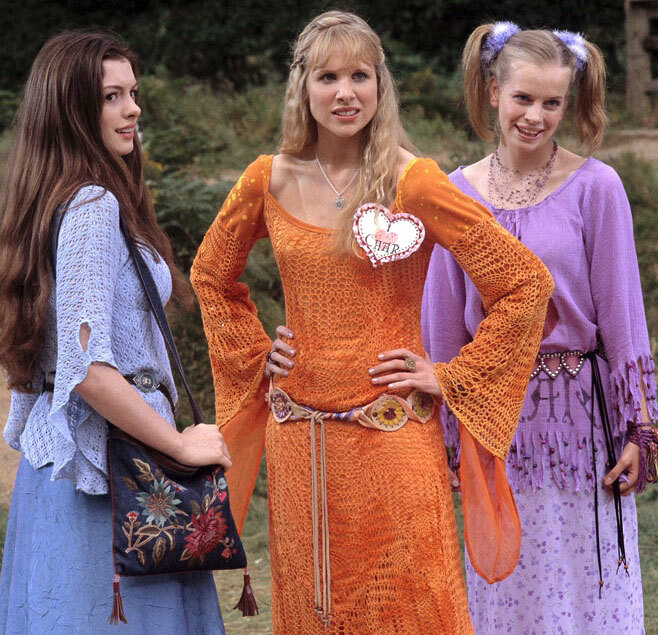 This is particularly true in the scene where Ella’s step-sisters order her to cover for their own misbehaviour, by telling their mother that it was Areida who peer-pressured the girl into shoplifting… then ordering Ella to tell Areida that they can’t see each other anymore, and that she could never be friends with a foreigner. Nagra and Hathaway manage to sell this disappointingly underwritten “break up” scene, purely through the power of their acting, bless ‘em… and it’s this traumatic split that provides the catalyst for Ella to set off on a quest to track down the boozy faerie who cursed her in the first place. But, once she’s on her way, she gets caught up in all sorts of other screwball shenanigans, including a plot to assassinate the Prince she’s slowly falling in love with (yawn! ), and Areida is largely forgotten about. There are a few quick shots of her smiling and toasting the happy couple at the end, to show that all is well again, but no actual, onscreen reconciliation between them. Boo! Not to say that there aren’t plenty other fine actresses filling that hour-long void between Nagra’s scenes: Minnie Driver is largely wasted in the role of ‘Mandy’, a “household faerie”, with barely any powers to speak of, who can only stand around making snarky comments while Ella is abused by all and sundry. Joanna Lumley is fantastically snooty as Ella’s stepmother, ‘Dame Olga’… while Lucy Punch and Jennifer Higham make for a very funny double-act as her devious daughters. Oh, and Vivica A. Fox pops in now-and-again as ‘Lucinda Perriweather’, the extremely irritating and amoral faerie who cursed Ella in the first place, claiming that it was a “gift”. Feh. Overall, I enjoyed this flick a fair amount, and I appreciate the way they tried to weave more serious subjects like slavery and segregation into the storyline… but a lot of the jokes were too silly and childish to really bear the burden of the weightier themes, and I doubt it’ll collect too much dust on my shelf before it goes back to the charity shop from whence it came. P.S. There are some really great FX shots here that Fantasy fans might enjoy… from the insanely epic opening sequence, to the talking book (faced by Jimi Mistry), and a great cutaway of a carriage crammed with Ella’s multi-racial rescue party! This entry was posted in Rants about Films and tagged Anne Hathaway, Ella Enchanted, Jennifer Higham, Joanna Lumley, Lucy Punch, Minnie Driver, Parminder Nagra, Vivica A. Fox. Bookmark the permalink. Oh yeah… Hathaway singing and dancing is always a good thing, and you can’t go wrong with an out-of-the-blue Queen number (see also “A Knight’s Tale”, anachronisms be damned! ).